There a spot along my walk to and from work where a property owner has planted a pear tree in front of his building. Pear trees often are favorites of landscapers because they tend to grow quickly, and for much of the year it’s a perfectly nice tree. But here’s the thing — pear trees produce pears. That’s OK, as long as you pick the pears and consume them, or donate them to the local food bank, or compost them if they aren’t especially tasty. But you can’t just let the pears fall to the ground unattended. 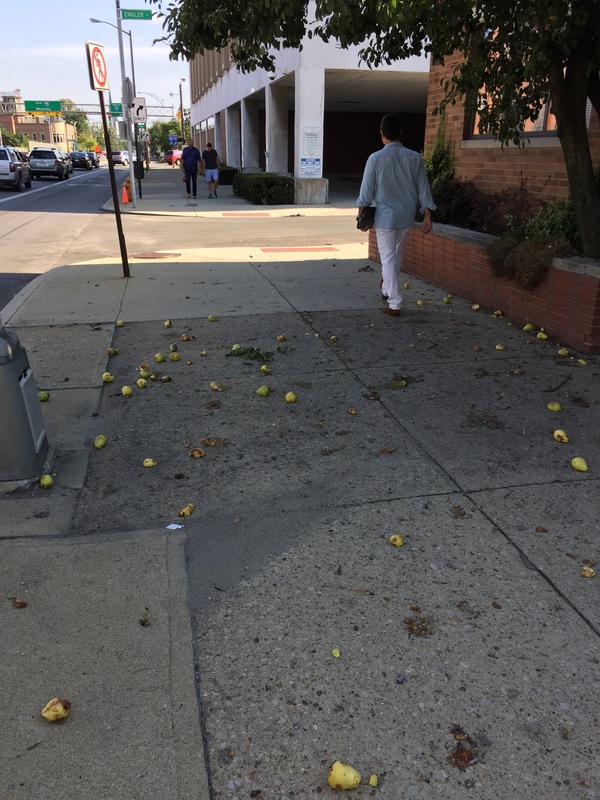 Pears rot, and rotten fruit smells, and attracts bees and flies, and gets stepped on and smeared all over until the whole sidewalk is a disgusting, reeking, bee-ridden mess that the intrepid walker must approach with grim caution and careful footsteps. In short, it’s not a pretty sight. Which raises a question: why would any business owner want anyone coming to their front door to pass through such an area? Pear tree owners need to pick up after themselves.